Let’s start out by defining a Trawler. In the truest sense a trawler is a fishing vessel, very stout and heavy with high deck railings capable of heading out into the ocean to catch vast holds of fish and return to port safely. The “trawler market” for production built recreational power boat models was really launched by Grand Banks Yachts in the 1960’s. Grand Banks Yachts built a series of “trawler style” power boats that opened up an attractive cruising option and had its greatest appeal to sailors who were “aging-up” and wanted to still be able to spend time on the water, but did not want to mess about with sails and lines. Other companies, many of them who started out creating sailboats, followed along and by the 1990’s a wide variety of builders like Kadey-Krogen, Nordhavn, Sabre, Fleming and dozens of other brands spawned a huge boom in trawler options with designs ranging from coastal cruisers to ocean crossing passage makers. There are now fast planing trawlers skimming over the top of the water at speeds over twenty knots and full displacement hulls plowing the seas 24/7 for weeks at a time. 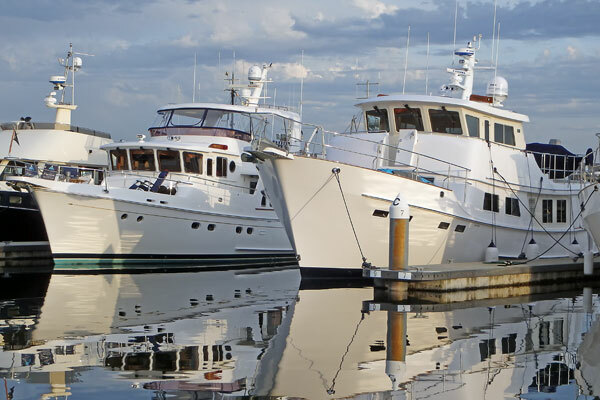 As more and more buyers caught the bug the transition from strictly monohulls to the inclusion of trawler catamarans evolved. All of this was popularized in the boating publications with special credit given to PassageMaker magazine for opening the door and broadcasting the parade. PassageMaker was initially focused on full displacement long range trawlers, but also called to attention the growing demand for “trawlers” to include tugs, multi-hulls and essentially, a new trawler definition emerged, “Any power boat that is comfortable to cruise on for the amount of time her owners desire to be out boating”. Sure, there is a “trawler look”, even a “tug look”, but if it isn’t a sport fishing boat (although even some of those are ‘trawlers”) then the very broad term TRAWLER will apply. There are so many trawlers to choose from that you will be more productive in your search if you develop a method to narrow your choices. Even if you don’t have a set budget in mind (yet), the cost to purchase, upgrade and maintain is probably the single biggest limiting factor – you need to have some sense of the price range you can comfortably afford. Next is how much space you need. For most trawler owners a two stateroom, two head boat is all they need – it’s typically two people spending the bulk of their time together on board with friends and family visiting (and that is where the other stateroom comes into play). If you intend to have a trawler large enough that it will require a captain and crew to maintain it then you want to look at trawlers large enough to provide the staff reasonable accommodations while also providing a separation of space between family/guests and crew. This get’s back to one of the original decisions you need to consider, namely what type of cruising do you intend to do? There are different requirements for coastal meandering versus extended voyages involving ocean crossings and knowing what type of traveling you want to do will also greatly influence your selection. If you will continue to work and need to stay relatively close to home because you can only break away for a couple of days at a time, a faster trawler that will deliver you to your get away destination Friday afternoon and home in time Sunday evening to resume the work week may be your best choice. As you contemplate these questions you will develop a “decision tree” – either mentally or by formally writing something down on paper to “map out” your thinking and ultimately create a guide to the type of trawler that will help you define your personal parameters and achieve you objectives.